I know a few of you are waiting for a daily update on our little bunnies. 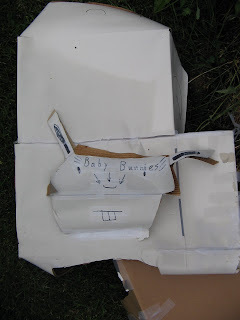 Last night it started to rain so Elly made a little cardboard cover for the bunny nest, to which Ian immediately added an addition and sign. It was very cute. Unfortunately (being made of cardboard) it started to dissolve in the rain right away. 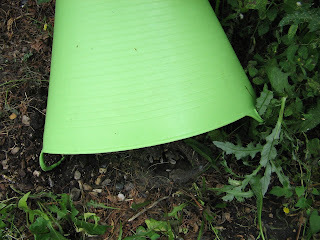 So instead we half-covered them with a rubber garden tub. It kept the rain off them and Nigel and Ian saw the mother return to the nest around 8:30PM, so I suppose she approved. In the photo you can see two of them have a small white diamond on their foreheads. They lose that as they mature. It's astounding how fast they're growing. They'll probably be independent within two or two and a half weeks. I'm going to share another part of the tale of the bunnies, but if you have a weak stomach, you'd best not read it (I mean you Jane). I'll leave a little space so you don't accidentally see any upsetting text (don't worry there's no photos). 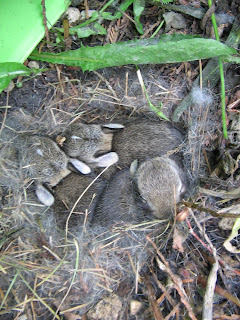 When I checked on them this morning I noticed a small bunny corpse covered in maggots a little ways from the nest. I picked it up (with a shovel) and tossed it in a garbage bag. It was much smaller than the others, so i assume it died a while back and the mother removed it. I'm hoping I don't find any more. Mmmmmm, you should have saved the dead bunny and maggots for Nigel and Ian for their bunny cacciatore. Ack. eeeewwww..... The poor little thing, and the little cover is so cute!